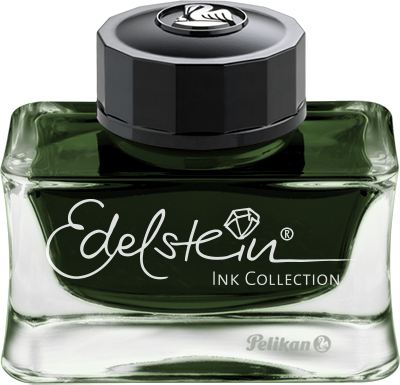 One day ahead of schedule, Pelikan announced today via their Facebook page the winner of the contest to design the Edelstein Ink of the Year 2018. Submissions were received throughout early May and a colorful array of inks ultimately made it into the top 15. Those lucky designers will receive an Edelstein ink of their choosing. A jury met on May 25th to narrow that field down to just 3 candidates. While it is not clear just which colors made it into the top 3, those winners will each get bottles of the last three Ink of the Year colors. That brings us to today’s announcement. After taking those three and analyzing the feasibility/marketability of the colors, Pelikan has selected an Olive-Green submitted by Johannes from Cologne as the winner of this contest. It seems that the ink has yet to be officially named after a gem stone as they are simply calling it Olive-Green on their Facebook page. Johannes will get a Souverän M400 with his choice of nib for his winning submission. The Pelikan’s Perch sends out heartfelt congratulation to Johannes and all of the top 15 finalist.